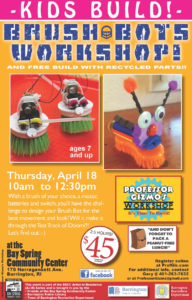 Professor Gizmo is at it again and needs your help with the Brush Bots Workshop over April vacation! With a brush of your choice, a motor, batteries, and a switch, you get to design your very own Brush Bot. Will it make it through the Test Track of Doom? Plus, a free build with recycled parts follows. And remember…pack a peanut-free lunch. The Board of Directors of the Friends of the Bay Spring Community Center meets on the first Thursday of every month. Members of the community are welcome to attend these open meetings.